Sorry for not posting this sooner but I finished Cress! I finished it the 30th of December and loved it so much! Marissa definitely outdid herself in this book. It was obviously my favorite of the book that are currently out! If you read the first book and didn't love it, I recomend you move on to at least the third one because it seriously hit the ground running! 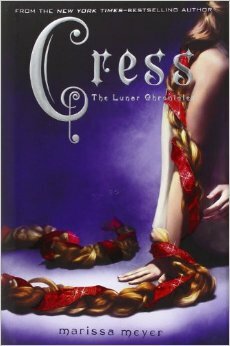 Cress was an amazing character to add in the series and the plot is just unfolding in the most amazing way! If you guys don't know about this series, I have a review on the first book "Cinder" which has a spoiler free section. Definitely recomend this series and can't wait for the last book "Winter". I hope you guys pick it up!